Salone del Mobile 2019: Discover The Top 15 Luxury Brands To See ⇒ One of the greatest global events for furnishing and design in the world is almost upon us. Salone del Mobile 2019 will provide a wide variety of exhibitions, styles, and cultures following the history of design, and showcasing the latest in furniture, lighting, and design around the world. Best Design Guides brings you 15 top luxury brands you really can’t miss at the event! Boca do Lobo is a maximalist Portuguese luxury furniture brand that combines design with artful craftsmanship wants to show the world the best of what Portugal has to offer. Surrounded by haute craftsmanship and art, Boca do Lobo will present a strong showing with some stunning pieces. Luxxu is a luxury design brand that combines classic with modern. The use of fine and luxurious materials such as gold and crystal is what makes the brand different. Their elegant design and the use of the craftsmanship are what makes the brand consistent, functional and with a lot of personality. Circu is a luxury design brand that focuses on kids furniture. The purpose of this brand is to inspire fantasy through dreams and to make kids dream in their own personal space. Purity and colour are some of the brand’s values. Maison Valentina is a luxury design bathroom furniture brand. A sophisticated and exquisite brand that seeks to offer comfort and luxury that you can find in other home areas, to the bathroom itself. Bathrooms, mirrors, and sinks are some of the products you may find in this stand. Essential Home is a mid-century modern furniture brand that takes historical and cinematographic references from the 1930s and 1960s which gives the products a unique character. The point is to create time travel within a unique space, creating a fusion between the past and present. Its a versatile brand with excellence design, glamour, and fun. The Armani/Casa collection focuses on visual and material lightness, a dimension played out between urban and natural, with sophistication combined with a variety of materials and a variety of colours with daring coordination, whose essential shades are red, indigo, green, and a petrol green. Brabbu is an urban design luxury furniture brand with a large variety of products. Each one of their designs is unique and versatile. Their products have a great finishing and are inspired by Nature, strength, and Culture. Rug’Society is a tapestry luxury brand with history. The aesthetic vision inspired on a daily basis, different and iconic with multiple styles and characters. The brand works with the most prestigious craftsmen and the most quality materials. Their products are visualized by visual artists with manual techniques. In the design, art de la table, furniture, lighting, object, and decoration worlds, Seletti has a history of vision and evolution. It was established in 1964, and ever since the company has pursued its mission of making the most of professionalism, service and above all, endless product research, striving for improvement, innovation, and originality. Luxxo is a Portuguese luxury brand that started in the lighting sector, and now, also has a lighting brand. Luxury, elegance and consistent personality are some of the words that can be used to describe this brand. Chandeliers, suspension lamps, pendants, floor and table lamps are some of the products you may find in their stand. The Luxxo Lighting Stand is at Euroluce. A lighting event that happens every two years inside Salone del Mobile. Aldeco is a dynamic and creative Portuguese brand, that commercializes high-end interior fabrics, inspired by the world’s heritage and cultures. Their collections are made with passion, innovation and always in tune with the latest fashion and design trends. Aldeco is a reference to architects, brands and many others around the world. Porada’s collection is wide and varied. The brand as a familiar heritage and it was born from the love of the wood, worked with the craftsmanship of those who know how to turn a log into a piece of artwork. Excellent quality and considerable experience in wood manufacturing are what makes the brand what it is nowadays. Craftsmanship, innovation, sustainability, and movement are some of the words that can be used to describe this Italian modern furniture brand. Poltrona Frau has several products such as sofas, armchairs, office furniture and tables all made and thought by the best contemporary designers. Edra appeared as an evolution between modern technology and tradition. Their products come from craftsmanship, new materials research and innovative technologies. The products are unique and all made with heart and professionalism. 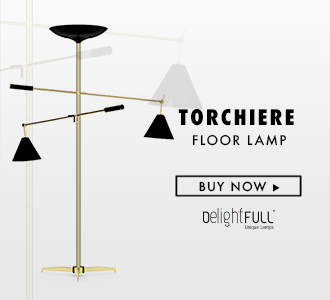 DelightFULL is a mid-century modern luxury lighting brand, that revives design and inspirational art from the 40s to 70s, bringing to you fresh classic lamps with the progress of colours and materials of modern decor. Our mid-century spirit can be suitable for any project customizing any piece that you need. Don’t forget to visit all these brands while at Salone del Mobile 2019!